A Lynx bus picks up passengers in front of the new Student Center. 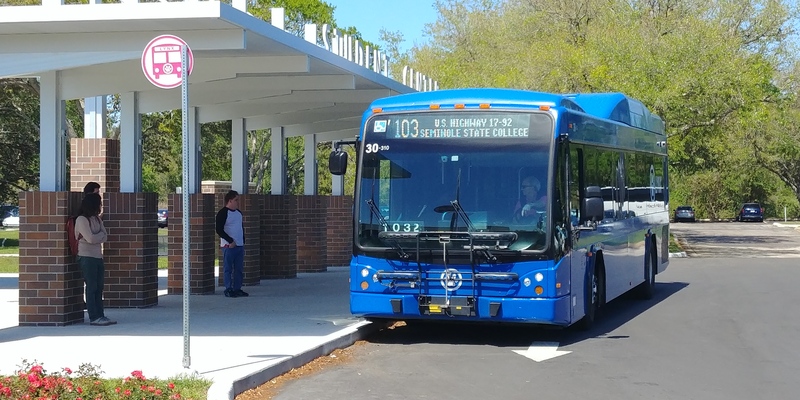 Seminole State College partnered with Lynx February 1 allowing students, faculty and staff unlimited rides for free. Dr. Jan Lloyd-Lesley, associate vice president of student development, pushed for this partnership to happen. “The service was started by our coordinator of The First Year Experience program, Tanya Fritz,” Lloyd-Lesley said. Fritz had seen what other colleges were doing with the service and wondered if we could do the same. Lloyd approached other administrators and the executive team approved of the idea. “We’ve been wanting to do some sort of transit or transportation for the campus,” Lloyd-Lesley said. After doing research and an influencing presentation, Fritz and Lloyd-Lesley duplicated the service that other colleges provide for their students. Working with Edward Johnson, CEO and President of Lynx was a smooth process, Lloyd-Lesley said. “He’s just very innovative and has some really great ideas about how to reenergized public transportation,” she explained. Johnson had a goal set to do outreach with the University of Central Florida and Seminole State. With his leadership and team work, he has allowed local college students access to public transportation. Students have been more than grateful since this service has started. A few students have been able to get to class on time without worry. “The purpose is to keep the students retained and in college and if we can alleviate transportation issues for students, then there’s no excuse not to come,” Lloyd-Lesley said. Having transportation will allow students to not only get to campuses, but also other places they need to reach. The grace period was the first week of the service. Students only had to present their student ID to board the bus. In the beginning, Lynx was dealing with some technical difficulties with the mobile app. The mobile app itself was something new to Seminole State. Lynx had the Paw Pass before, but developers had to adjust a couple of things to add Seminole State into the system. The advertisement of this service was planned to be announced earlier, but the morning of going live the mobile app was not yet added to the Apple App Store or the Android Google Play Store. The grace period was the solution for that. There are students without smartphones who use public transportation. Now there is currently two ways to board the bus, the mobile app with the Paw Pass and the Fast Pass. Students present their college IDs and the drivers have to manually count them. The signing up process is just boarding the bus. “There isn’t a sign up process, there’s an excel spread sheet with everyone’s name that is currently enrolled and the information that’s been sent to the mobile app developers,” Lloyd-Lesley explained. Lynx is tracking the data and soon will post reports of increase in ridership because that was the College’s way of helping Lynx. In the near future, there’s going to be an additional service that’s going to be beneficial to all students. According to Lloyd, without guarantee it’s happening, the colleges are looking at a specific transit system for students to go between Altamonte and Sanford, and then Sanford and Oviedo. “So we would have our own shuttle service for students, which is the second phase of working with Lynx,” Lloyd-Lindsey said. There is ongoing debate about how it would look and the cost, she said. Students would be able to drive to a campus and then shuttle over to different campuses for classes. Faculty and staff would also benefit from this shuttle service.